The rollicking, rambunctious show lives up to its spirited namesake: “Absinthe” is an intimate, Cirque-esque affair in a tent outside Caesars Palace that is likely to give pause to even the most seasoned spirit drinker. The production is equal parts lowbrow humor and high-flying acro, mixed well and poured over a sugar cube of incredible talent. The Gazillionaire and Penny Pibbets emcee the show and contribute a kick of bitterness with crass and spectacularly foul-mouthed dialogue that is unlike almost anything else in Las Vegas. The beauty of “Absinthe” is that it isn’t just a show. Walking into the Spiegeltent is like being transported to a time when circuses weren’t polished, politically correct productions with sophisticated sensibilities. The inside of the smallish tent is just plastered with all manner of paraphernalia and packed with people. The stage itself is only 9 feet in diameter, which creates more of a side-show atmosphere than a million-dollar proscenium theater ever could. And the performers themselves are dumbfounding. Four Russian guys throwing themselves and each other around? Check. A chick in roller skates spinning quite fast around a dude in roller skates spinning quite fast, perhaps by just an ankle or two hooked behind his neck? Check. An acrobat doing a headstand on top of a beer keg on top of a chair on top of a bar held by two guys on a tightrope? Check, check and check. 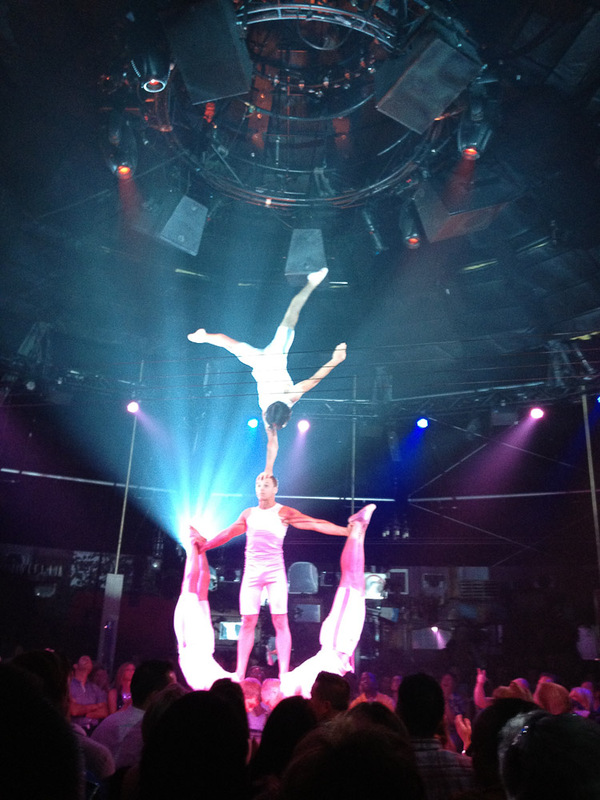 The Atlantis acrobatic group helps “Absinthe” stun audiences from the start. A sultry Green Fairy makes an appearance, as does a spellbinding trapeze duo and a straps act that is truly amazing. The skill of the multifarious artists is continually juxtaposed by generous doses of raunchiness from Penny and the Gazillionaire, though, which keeps things from getting too familiar to Cirque du Soleil connoisseurs. By the time the first 15 minutes of the show have transpired, Gaz (as his friends call him) has picked on Republicans, Mexicans, Republicans, blacks, Republicans, women, Republicans, fanny packs, and Republicans. In a performing world that seems terrified of offending anyone at all, “Absinthe” is a refreshing (if shocking, at times) breath of air. Like the heady green drink after which it is named, “Absinthe” might be hard to stomach at times, and it might leave you feeling a bit woozy after. If you’re looking for a different kind of show in this performance-saturated city of ours, though, it might be just what the doctor ordered. Find more information about “Absinthe” and Spiegelworld here and here, respectively. The latter link also includes more about “Empire,” another Spiegelworld show debuting soon in New York. Paul Carr also saw and reviewed “Absinthe” for the Huffington Post, and his take is available here. And, finally, KNPR’s “State of Nevada” recently featured some of the big brains of Spiegelworld. Check out the story here for more about “Absinthe,” “Empire,” and what makes the (Spiegel)world go ’round. 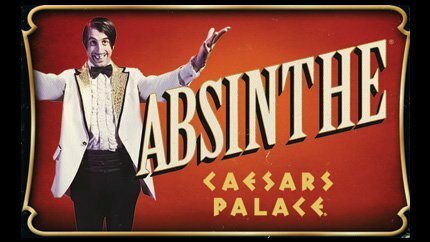 “Absinthe” is performed at 8 p.m. in the Spiegeltent outside Caesars Palace Tuesday through Sunday, with multiple shows on some nights. Click here for more about tickets and showtimes.